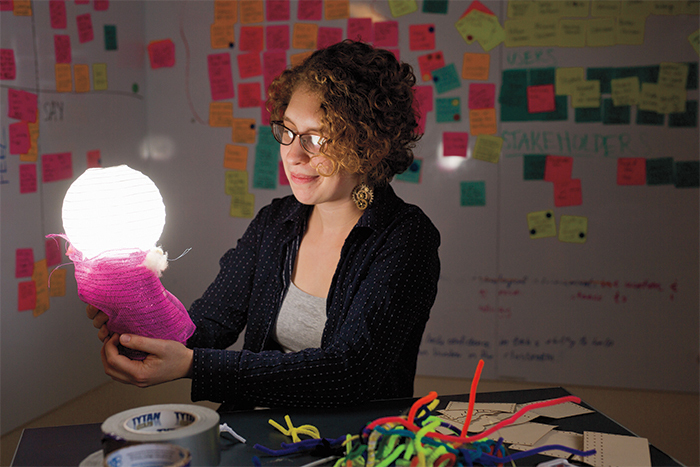 Engineering major Laura Lilienkamp ’18 is an enthusiastic advocate of design thinking. The Design Thinking Initiative had just launched at Smith when engineering major Laura Lilienkamp ’18 was a sophomore. 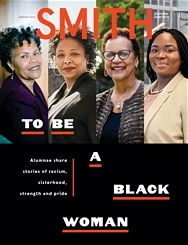 The program’s co-director, Zaza Kabayadondo, was talking about it at an information table at the Campus Center, and Lilienkamp was enthralled. “The design thinking process seemed really interesting, so I was like, ‘Get me involved as soon as you can!’” Lilienkamp signed up for the interdisciplinary course IDP 316 Design Thinking Studio, which she describes as a deep introduction to the design thinking process and how to go through it. She’s been an enthusiastic advocate ever since. DESIGN THINKING IS a way to solve problems that starts with empathizing with your user. The next steps are ideating, defining, prototyping and testing, but the process always comes back to empathy. It’s important to understand your users—who they are and what they care about—in order to make something meaningful. Design thinking can be applied to anything; I’ve worked on projects ranging from designing laser-cut wallets to prototyping a better way for students to find funding at Smith. DESIGN THINKING TEACHES YOU how to work in teams. If someone presents an idea to me, even if I think it’s a terrible idea, I won’t shoot it down. I’ll say, “This part of your idea is really great. Why don’t we integrate it into our design in this way?” That allows you to make your team happy and want to work together. It also gives you a better design because you’re taking the best parts of everyone’s ideas and combining them instead of immediately throwing things away that you think won’t work. STUDENTS WANT TO GET INVOLVED in design thinking. I think the appeal is the creativity and the hands-on approach. The “toys” are really cool—laser cutter, 3D printer, vinyl cutter, power tools—and the makerspace [in Capen Annex] just has good energy. The idea was to give women and gender minorities a chance to use technology that we’re not normally taught how to use and to have a supportive space for working on projects. Students can come and say, “I want to learn how to use the laser cutter. Teach me how to do this.” Anyone from any major can do that, which is neat. It’s a fun way to expose people to design thinking. IMMEDIATELY AFTER GRADUATION, I’m going to be doing an internship through the Design Immersion Experience, which is sponsored by the Design Thinking Initiative. I’ll be working on a design thinking–oriented project in another country. I chose ReMaterials in India. They design modular roofing for slums and villages out of recycled materials. I’ll be doing rapid prototyping and materials testing and trying to integrate the design thinking process into what I’m doing with them.